The coastal town of Ambalangoda, belonging to Galle District, is situated at the southwestern seashores of Sri Lanka, 25 km south of Bentota and 15 km north of Hikkaduwa, which are the main resorts at the west coast of the Southern Province. Most tourists come to Ambalangoda not for the sandy beaches but for the masks. Ambalangoda is the number one destination for the Sri Lanka’s manufacture of wooden masks and puppets, which are used in dancing rituals and dramas. The three main types of masks are Sanni, Raksha and Kolam. The puppets are Ruada. Sanni devil masks are used in exorcistic rituals. Devil dances to drive out spirits causing illness still occur in rural areas of Sri Lanka, though these practices are on the decrease. Each of the 18 Sanni masks represents a particular disease. Similarly daunting Raksha demon masks with bulging eyes and protruding tongues are more common in processions. The colourful masks that can be seen on several front covers of guidebooks are of this type, Naga Raksha (Cobra Mask), Maru Raksha (Demon of Death) and Gurulu Raksha (Bird Mask) being the most famous designs, often imitated in cheap materials for sell in souvenir shops all pver the country. Kolam masks are used in entertaining dramas of a more humorous type. Kolam dances were peaceful satirical criticism of social issues of the colonial period. Ruada, which is a form of puppetry, does not originate from Ambalangoda, but it became also part of its popular culture and handicraft. Genuine Ambalangoda masks are carved out of the light Kaduru wood, which has to be smoke-dried for a week after the basic form has been chiselled out. For the finishing touch, there are ancient scriptures with strict guidelines for the designs. The painters of the finally seemingly lacquered masks copy the design from a page illustrating the formatted patterns. Actually, the colours are mixed with a special oil to make them durable. There are several mask manifacturers and handicraft shops in Ambalangoda. Visitors who are interested in folk art should take their time to see more than one of them. For those in a hurry: For instance Lanka Masks in the city centre is well-known. However, the most renowned manifacturer is Ariyapala and Sons of the Wijesuriya family (Wijesooriya) further north. The company is named after their ancestors Ariyapala Wijesuriya Gurunnanse. The company’s website http://www.masksariyapalasl.com/index.htm provides plenty of valuable information, particularly about the different types of masks at http://www.masksariyapalasl.com/about_masks.htm. If you are interested in buying this kind of genuine Sri Lankan handicraft, as a souvenir that will not turn out to be made in Hongkong, it is highly recommendable to visit their page in preparation of your visit to Ambalangoda, to get a first impression of the variety of traditional designs to choose from. In 1987, Ariyapala and Sons opened the small but famous Ambalangoda Mask Museum. The project was inspired by a German tour guide, Dr. Wolfgang Mey, who had studied ethnology in Berlin and Zurich, specialized on the culture of hill tribes in eastern India and Southeast Asia and worked for various ethnological museums. When Dr. Mey was studying the Kolam tradition, he came to meet Mr. Wijesuriya, who was one of the last specialists in this field. A dancing school was also established in order to sustain the museum. Though it definitely serves as an exhibition hall for PR purposes, too, visiting the delightful mask museum is both entertaining and informative. Not ot all of the 120 traditional types masks can be displayed, but two entire collections of a specific Sanni ritual and a typical Kolam Dance are showcased in the rooms. 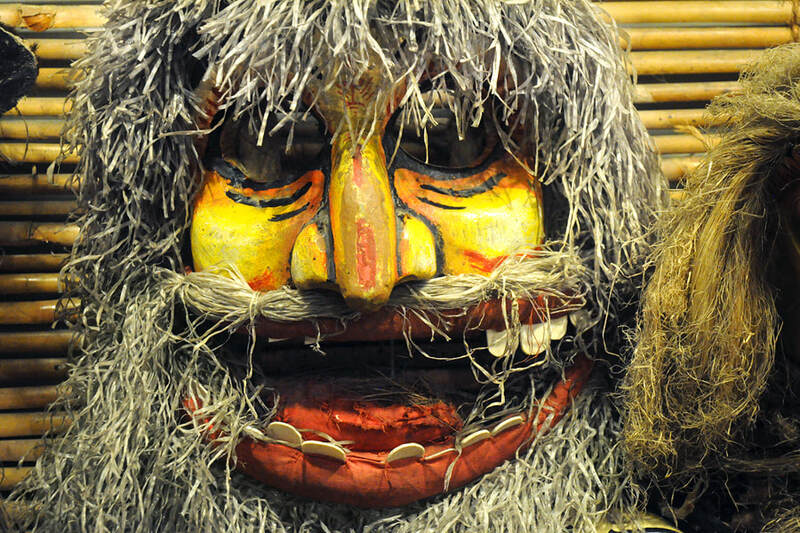 In the adjacent workshop of Ariyapala & Sons you can see the entire process of mask making.